Federal officials say it’s critical for any Iowans with backyard chickens to take every precaution to protect their flocks from the latest outbreak of avian influenza. Catherine Woteki , an undersecretary at the U.S.D.A., says Iowa’s already seen three large commercial operations severely impacted by H5N2 in the past two weeks and the virus is clearly spreading around. Woteki offers a few tips for Iowans with backyard coops. “Make sure you use a dedicated set of boots,” she says. “Be sure to wash your hands before and afterwards. Keep your backyard flock separated from wild birds.” It’s believed the bird flu is being spread by wild waterfowl, like ducks and geese. Woteki says Iowa bird owners need to keep very close tabs on their flocks and let a veterinarian know if something’s amiss. “It’s very important that sick animals and any unexpected deaths be reported just to check up and see if there is an exotic disease that’s causing a problem and so the rest of the backyard flocks will be protected,” she says. 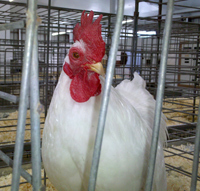 Bird flu is reported in at least a dozen states since the start of the year. A turkey farm in Buena Vista County had to euthanize 37,000 turkeys last week after being confirmed with the disease, while a much larger loss was reported in Osceola County. That egg-laying operation was forced to euthanize three-point-eight million hens due to an outbreak. A third case was announced late Thursday involving a flock of 34,000 turkeys in Sac County.